To extract only 10 grams of gold, huge conveyor systems must move up to 5 tonnes of ore. With the extravagant use of heavy machinery, diesel exhaust fumes are emitted into the atmosphere. Also the use of chemicals such as mercury and cyanide make gold prospecting a burden on the environment. Furthermore, where gold deposits are being exploited, the rivers are dammed up, forests felled, mountains removed. These are all good arguments for the recovery of old gold, re-melting it in refineries and an intensive recycling. In this way new gold is recovered, with far less damage to the environment. It is incredible where recoverable gold or at least usable traces of it are to be found: in dental gold, in old, faded and no longer worn jewellery, but above all in defective technical equipment, industrial fittings as well as electrical scrap. Due to its excellent material properties, gold has a multitude of uses in modern technological products. The melting down of unused dental gold, crowns, inlays and dental alloys is routine for specialised laboratories. There is a differentiation between yellow and white gold and more importantly gold-bearing dentures. Apart from gold, the alloys also contain silver, platinum and palladium.- the gold content can be up to 90%. Many owners of unused dental gold are unaware of its value and at today’s market price how lucrative the proceeds could be. An evaluation by an expert ascertains the exact gold proportion. That this is financially worthwhile, lies also on the high price of gold. Because of the very high melting point of dental gold, often alloyed with platinum, just the separation of the gold and platinum from a kilogram of dental gold has associated costs of 200 Euros. 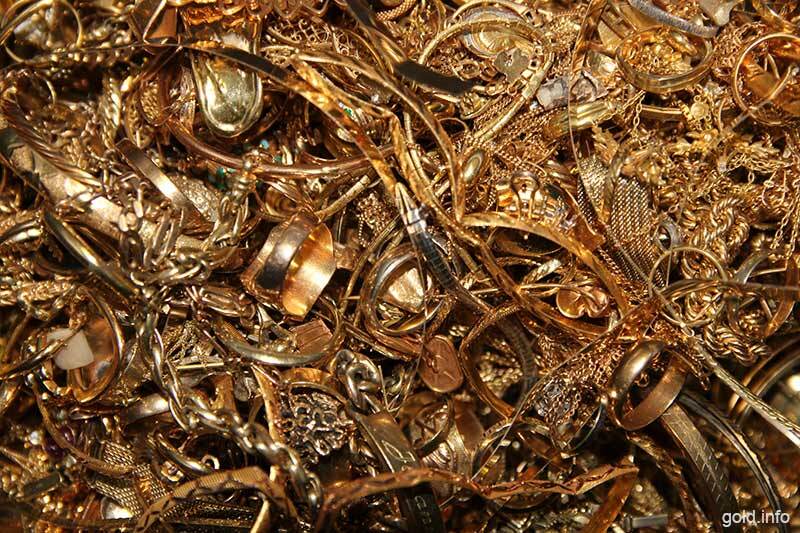 In a precious metals foundry mainly pieces of gold jewellery, gold bars and gold appliqués are processed. Also here a laboratory initially analyses the fine gold content, which can be very different. Where necessary, decorative stones or glass pearls must be removed from jewellery and the components separately melted down to ultimately recover the pure gold contained in the jewellery. Gold Bearing Electrical Scrap in Mobile Telephones, Computers and Co. The most exciting recycling source is undoubtedly our electrical scrap. The electrical contacts in mobile telephones, computers or cars sometimes include a small amount of gold, which improve the electrical conductivity. Also factories, workshops and residential homes count as gold bearing, which is why experts talk of “urban mining” and initially claim these “suburban deposits” before destroying the natural environment. Additionally, undertaking well-published technological gold recycling, especially in countries such as Germany which are poor in resources, frees them from expensive imports and makes them somewhat more independent. Naturally, the gold content of electrical scrap belongs to the smallest category. However: from 40 scrap mobile phones for example, nearly as much gold can be recovered as can be mined from a tonne of gold bearing ore. A tonne of old computer circuit boards produces more than 200 grams of the precious metal. Whereas gold from jewellery brings a 90 percent recovery, gold from electrical scrap has up to now only about 15 percent. The majority of European scrap equipment is shipped to Asia or Africa to be salvaged, where it mostly remains hidden. Recycling experts refer to a value of 3.7 billion Euros, which this lost precious metal could achieve. In the coming years it will be seen how sustainable our economy really is. Everybody can make his contribution. A mobile phone, an old laptop are important raw material sources, that should not be simply thrown in the rubbish unused.